I’m not really sure how to sum this one up in my own words. 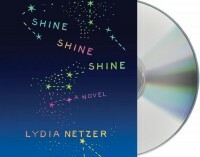 Let me try this: Shine Shine Shine is Lydia Netzer’s ambitious, strange, genre-blending debut novel, and while it seems to reflect a wide range of influences, the whole of it is strikingly original. Shine Shine Shine ’s primary narrative thread is propelled by two collisions occurring within days of each other and over a hundred thousand miles apart. Nine-months-pregnant Sunny Mann’s minivan is broadsided while she is driving home with her autistic son, Bubber, after visiting her dying mother in the hospital. The only casualties are the van and one of Sunny’s wigs--its flight into a puddle exposes her to the neighbors as completely bald. The accident occurs on the day her astronaut husband Maxon has left on a mission; he’s with the team charged with delivering the robots he developed to prepare the moon for a human colony. But when their ship is hit by an asteroid and they lose communication with NASA, their mission--and lives--depend on Maxon’s ability to put those robots to work a little earlier than expected. The parallel threads of accidents and aftermath are intercut with flashbacks to Sunny and Maxon and their near-lifelong history together, as seen from both of their perspectives and by Sunny’s mother, Emma Butcher. Maxon and Sunny are an odd couple, but not in the sense of being a strange match; it’s because that they’re both odd. Sunny’s not just bald-headed, she’s a completely hairless, fatherless girl who craves normalcy, and Maxon is a misfit genius with some resemblance to the robots he’ll eventually create. These people could have been portrayed as not much more than off-putting collections of quirks, but for the most part, Netzer dodges that potential hazard. Although I found the storytelling in Shine Shine Shine a little overworked in spots, I was won over by the richness and humanity of her characters. I could identify with them, but I didn’t feel like I’d met them before, and I appreciated that. This novel first came to my attention last spring in a Shelf Awareness “Maximum Shelf” feature, and while it seems to have fallen short on the book-blogger buzz-o-meter since then, it lodged in a corner of my brain as “the one about the bald wife and the astronaut” (although at times I did confuse it with the also starry-covered The Age of Miracles). But when I learned that the audiobook was narrated by Joshilyn Jackson, I quickly and easily decided that I wouldn’t delay in reading Shine Shine Shine by ear. Jackson beautifully differentiates the three narrative voices, and her performance seems to convey a real affection for the material--the narrator and the author are long-time friends. If you also choose to read this as an audio, stick around for the conversation between Netzer and Jackson about the book and two songs from Netzer’s “folk-punk” band, The Virginia Janes, that close the recording. I’ve seen mixed blogger responses to Shine Shine Shine which really isn’t that surprising--in its way, it’s as odd as its protagonists, and that won’t work for every reader. I loved it for the fact it wasn’t afraid to be odd, but I’m still trying to decide how much I loved it for itself. 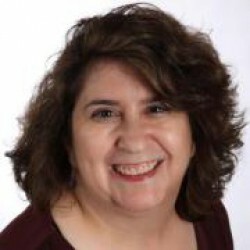 In any case, it captivated me, and I’ll be interested in seeing how Lydia Netzer follows it up.